Revlon is a stunning female with an outstanding fleece exhibiting a well-defined, uniform crimp structure throughout and excellent density with a flawless phenotype - balanced proportion, erect presence, straight legs, correct bite, gorgeous head, consistent coverage from noes to toes with an extremely soft hand, long staple, well organized bundling and tight crimp. 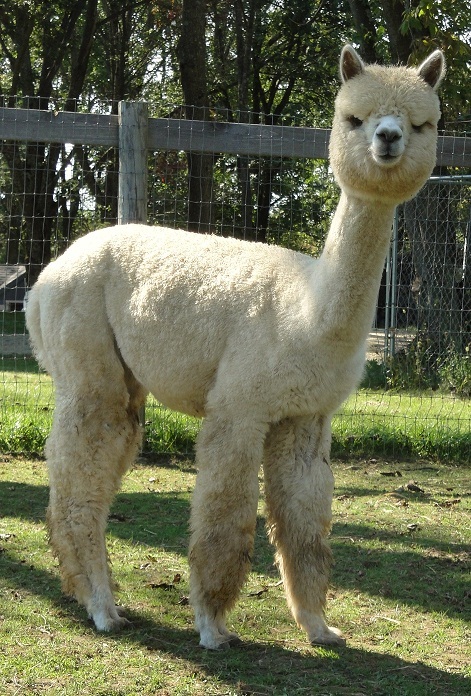 Revlon has a brilliant white fleece with a "sprinkling" of medium brown fibers that are not readily seen until you open her fleece, and only add to her beauty. Revlon accomplished two Champion awards before her first birthday, the first at 7 months of age. Daughter of MFI Tachometer (Futurity Reserve Color Champion and son of 8X Champion MFI Cactus Jack, who sold at the 2007 Breeder's Choice Auction for $150,000). You've got to love her!